Near FM present a three part documentary on Frank Harte, the Frank Harte Festival & An Góilín Traditional singing club. 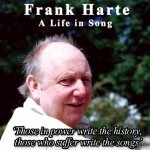 Frank Harte was a renowned traditional Irish singer & song collector. Every year since his death in 2005, the traditional singing club An Goilin has run a festival of traditional Irish singing in his honour. This documentary series captures a snapshot of this festival as it was in the year 2012 and provides the listener with an in depth look at the musical life of Frank Harte. We document the festival in chronological order with a programme documenting each day of the festival: Friday, Saturday & Sunday. This series profiles Frank Harte, captures the famous, intimate & unique An Goilin singing circle; fly on the wall atmospheric and historical walking & singing tours of Dublin, lectures as well as interviews with friends and family members. The centerpiece of the three day festival is a Gala Music concert from the Saturday night which features in programme 2 of the series. Frank Harte had a keen knowledge and sense of Irish history and in this series, through Near FM archive footage, we revisit Frank giving a talk in Coolock library in 1998 to celebrate the 1798 rebellion led by Wolfe Tone. Songs he sang such as Father Murphy, Dunlavin Green & Henry Munroe were born out of this period. A Near FM Production. Produced, narrated & edited by Paul Loughran. Additional production by Ruairi O’Broin, Ken Tuohy, Zandra Ball and the late Pat Guerin. Made with the support of the BAI Sound & Vision scheme funded by the Television Licence fee.